Interesting title for what is probably the most misunderstood card in tarot–Release/Death. As we continue our Dreamer’s journey we come to card 13. In the Rider-Waite (RW) tarot it is the Death card; in Angel tarot it is Release. I like that Doreen Virtue and Radleigh Valentine (creators of the Angel Tarot) have renamed this card–Release. It sounds better to say we are releasing something that no longer serves us rather than Death is on its way. The Release card can show up when we are ending relationships, jobs, or transitioning to some other new identity or stage in our lives. Because we all are creatures of habit, I think it fair to say that many would prefer the known rather than the unknown. How often do you hear of individuals staying in relationships that clearly are not healthy simply because the known is something we become comfortable with. In the RW tarot there is a transformation from lower to higher; from a known reality to a more spiritual unknown. 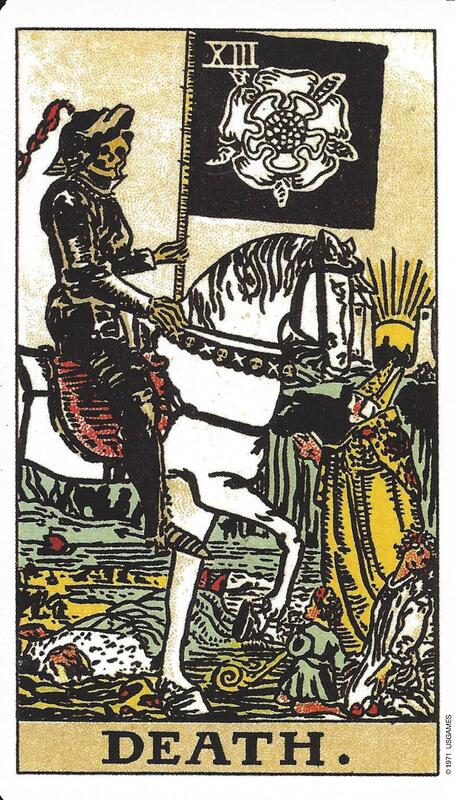 The horseman is moving slowly carrying a banner or flag with an image of the Mystic Rose which symbolizes life. You may also note he carries no weapons. If you look closely at the right-hand side you will see a sun blazing between two pillars, symbolizing immortality. In Angel tarot, it is Archangel Azrael who stands before us with arms outstretched. Although not clearly seen, there is a phoenix on his robe, signifying we will rise again, a rebirth of our Selves to a higher plane. He walks among a field or white roses symbolizing rebirth. Archangel Azrael’s name means “whom God helps.” We do not have to release the old alone. We can surround ourselves with family and friends who will help and encourage us to release that which no longer serves us. 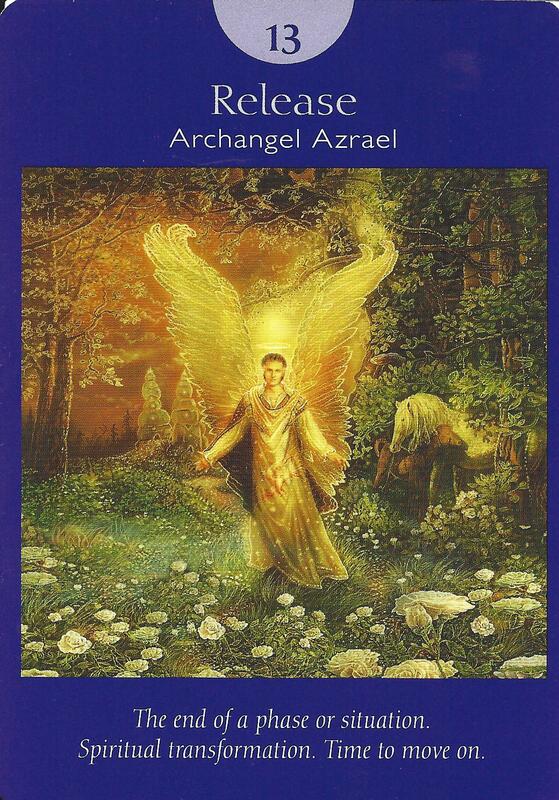 Archangel Azrael is a good angel to pray to when we need help letting go.